The Dallas Mavericks are returning to Miami just one win away from their first NBA Championship in franchise history. The Mavericks led most of the way, and then overcame a Miami rally in the fourth quarter to win game 5 of the NBA Finals. After trailing by as many as 9 points in the second half, the Miami Heat took a four point after a Dwyane 3-pointer with 4:34 left to play. 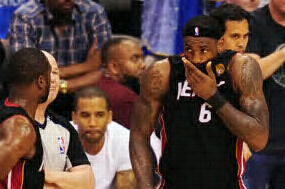 It looked as if the Heat were about to seize control of the game and take the 3-2 series advantage. But as we’ve seen all series long, the Dallas Mavericks found away to overcome the Heat rally and used a 15-3 run to close out the game. Dirk Nowitzki got a lot of help tonight as Jason Terry and Jason Kidd helped Nowitzki close out the game tonight. Down three, Jason Terry knocked down a huge 3 to tie the game at 100. 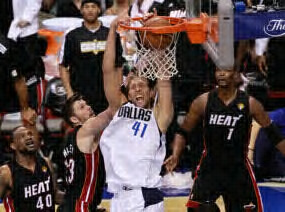 With the game tied, Nowitzki drove past Chris Bosh and slammed home a go head basket that put Dallas up 102-100. With the Mavericks up 4 with a little over a minute left, “The Jet” Jason Terry hit a dagger 3 to put the Mavericks up 7, which sealed the game. Dirk Nowitzki led the Mavs with 29 points and 6 rebounds. Jason Terry and JJ Barea had their best games of the series scoring 21 and 17 points respectively. Tyson Chandler and Jason Kidd added 13 points each. Dwyane Wade once again paced the Heat scoring 23 points. A majority of Wade’s points came from the free throw line, as he was hampered by a hip injury suffered in the 2nd quarter. LeBron James recorded the quietest triple-double you will ever see in a Finals game. He finished with 17 points, 10 rebounds, and 10 assists. These numbers are extremely misleading, as James still hasn’t shown up in these Finals the way his team needs him to. James continues to disappear in the fourth quarter, scoring only 2 points. The one bucket he made was an uncontested layup in the final seconds. He continues to brick all of his jumpers, but yet won’t attack the paint. The Dallas Mavericks will try to close out the series and win the NBA Title on Sunday night in game 6. 11 fourth quarter points through five games!